In traditional medicine system Kokum is indicated in treatment of gas, heat stroke, diarrhoea, dysentery, skin diseases and infections. Kokum (Garcinia indica) is an evergreen tree indigenous to India and found in Western Ghats from Konkan southwards and in Goa. It is cultivated in southern districts of Maharashtra and on lower slopes of Nilgiris. Kokum tree is also found in Assam and West Bengal. Kokum has culinary, medicinal and industrial uses. The dried rind of fruit is used as condiment for making curry. A drink prepared from fruits is taken in summer to relieve sunstroke. In traditional medicine system Kokum is indicated in the treatment of gas, heat stroke, diarrhea, dysentery, skin diseases and infections. Kokum fruit is dark purple in colour and weigh about 15-20 grams. The fruit contains substantial amount of malic acid but very less citric acid. Malic acid is acidic, reddish colored and gives the pungent sour taste to fruits. The pulp of fruit is used to make Sherbet/sweet drink. Dried kokum fruit is known as amsul/aamsol and added as condiment in curries. Seed’s kernel are processed to obtain an edible fat, Kokum butter/kokum oil/kokum ka tel. Kokum butter is used as substitute for cocoa butter in chocolates. It is also used in the treatment of diarrhea and dysentery. 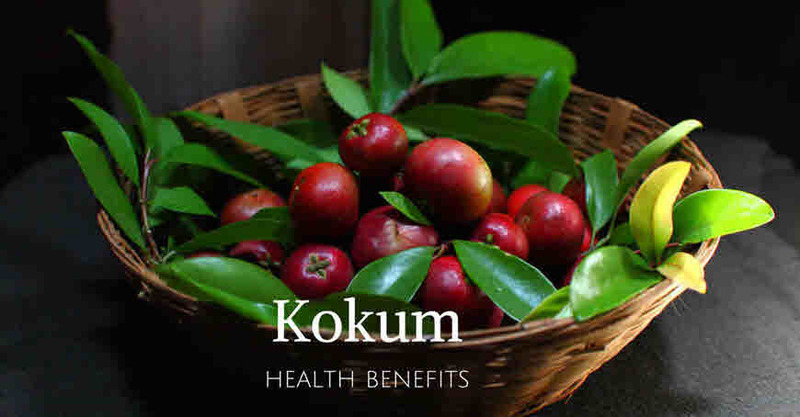 In Ayurveda Kokum fruit is used in the treatment of a variety of ailments. It is an appetizer and tonic for the liver and heart. The fruit infusion is used for treating skin diseases, like allergies, chaffed skin, rashes, burns and scalds. It is also given in heat stroke, dysentery, diarrhea, piles and heart diseases. Kokum fruits are used for weight management. They help to reduce weight. Presence of Hydroxycitric acid in fruits makes it effective in weight-loss. This acid increases serotonin availability in the body, reduces weight and increases oxidation of fat. A polyisoprenylated benzophenone in fruit rind has an antioxidant anti-cancer and anti-ulcer properties. For purgative purpose a powder is prepared by mixing fried Hing/asafoetida, Kokum fruit, fruits of bishop’s weed (Ptychotis ajowan), rock salt, and fennel/Saunf. All are taken in equal parts. A dose of 2 to 6 g of the powder with 5 ml of fresh lemon juice twice/day cleans excess Pitta and cleanses small intestine and colon. Kokum fruits are cooling in nature. A sherbet (known as Amrit kokum) prepared from the pulp is rich in antioxidants and quenches thirst. The fruits alone are useful in gas, fluid retention, alcoholism, weakness of digestive system, excessive thirst and oral diseases. Kokum fruit is also used in dried form to make dishes sour. Kokum fruit seeds contain an edible butter which is known as Kokum butter. Kokum butter is applied topically on ulceration, skin diseases, cracked lips, and dryness. In mucous diarrhea or dysentery, kokam butter is given in a dose of ten grams with a glass of milk, thrice a day. It can also be used as substitute for animal fat.